It’s a pattern we’ve seen for several quarters: Apple’s (s AAPL) Mac sales post double-digit percentage increases as the broader PC market limps along with single-digit growth. So it’s not a huge surprise to see the Mac again making progress in its battle for market share. In a report issued Thursday, Needham & Co. analyst Charlie Wolf said the Mac had reached 5.2 percent of worldwide computer sales. While that seems like a tiny slice of a huge industry — and it is — it’s the largest chunk of PC market share Apple has owned in 15 years. Yes, 5.2 percent is significant for Apple, the computer side of which brings in huge profits for the company, but maintains a relatively low sales share compared to the HPs (s HPQ), Dells (s DELL), Acers and Lenovos of the world. But the momentum is Apple’s right now. It’s growing both in the consumer space, where it was up 24.6 percent compared to overall PC growth of 5.3 percent, and perhaps more surprisingly, in the workplace. The growth, as the chart shows, isn’t coming in just one area, but is spread throughout the wider enterprise market for computers. Apple saw decent gains in every sector, with the exception of government purchases, but saw significant growth particularly in “very large” and “large” businesses. Macs are no longer much of a rarity in the workplace. For many years, there were valid reasons Macs were used mainly in the publishing and creative spaces, since software compatibility made it hard to use them elsewhere. But as consumer adoption of Macs has increased steadily in the past few years, many employees are either asking their employers in all industries to buy them the same Macs they’re using at home, or they’re just bringing in their MacBook from home to the office. And increasingly, IT departments are letting them. Be sure to grab a ticket to our Net:Work conference on December 8 in San Francisco to learn more about the changing face of IT and the ongoing consumerization of workplace tech. I sincerely think the number 1 criteria in working for GigiOm is you absolutely must be a maniacal, off-the-charts Apple fanboy (or fangirl), must have an Apple tattoo somewhere on your body and you must swear never, ever to write an unflattering post about Apple. Sheesh. @Peter Mullen: Why would reporting the fact that Apple market share is increasing (not to mention Apple profits and installed base) engender such a comment? Oh, yes, because the facts make it hard to do anything but be a troll about it. This reminds me of the recent decision of Adobe to drop flash mobile development. The android crowd made a lot of noise blaming Apple/Steve Jobs for this, while simultaneously insisting that Android was winning the marketshare war. Trying to point out the obvious problem with this “logic” was a quick way to get the same snotty response about being an “Apple fanboy”. While Peter’s comment may come off as a little abrasive, his point remains. If Dell, HP, or Sony had increased their marketshare by some 5 percent you can bet that you would NOT see it reported here (or anywhere else for that matter). So while I’m very much a fan of Apple and their products, I agree that there’s no for every fart that Cupertino being front page news, which most tech blog websites seem hell-bent on doing (examples being GigaOM, Engadget, Gizmodo, BGR, I could on…). I get the notion of the wanting to cheer on the little guy and stan for products you love, but at this point it’s gone past annoying and moved into unhealthy obsession territory. Sidenote: Android does have more marketshare than the iPhone, though I don’t know if I understand what any of that has to do with Flash. That’s because Dell, HP, and Sony spend tons of resources specifically targeting the enterprise market. Apple doesn’t. 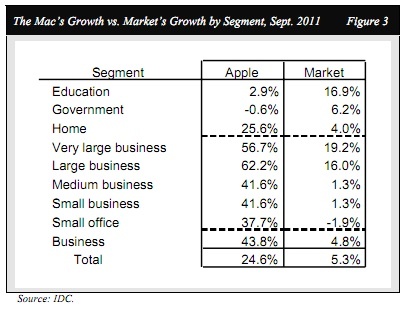 That this growth is happening despite Apple doing very little to actively pursue enterprise makes it news. Dog bites man vs. man bites dog. What’s funny is how Apple haters get all defensive to hear Apple is doing better and better when they should have gone out of business by now.